There’s not much that this bad boy has to do to sell itself besides saying it’s a Fender. In all seriousness, though, the Fender T-Bucket 300CE does lend itself well to neophytes, but it would probably be better for adepts and mages who feel more inclined to diddle with higher frets, which, thanks to the cutaway. The Fender T-Bucket 300CE would be a classic dreadnought if it weren’t for the single cutaway. This feature makes it particularly suited for those who have already been playing for a while, and wish to experiment a wee bit with the higher-end strings. The choice of material makes it maple/mahogany/rosewood combination, with maple for top, mahogany for back, sides and neck, and rosewood for bridge and fretboard. The back and sides of the Fender T-Bucket are laminated mahogany, making it fairly sturdy and able to weather some (inadvertent) punishment. The top is flame maple, also known as tiger maple due to its distinctive tiger-stripe pattern. As any maple, though, this top creates an overly bright sound, tempered by the mahogany body. As noted, the neck is mahogany-made, which, coupled with rosewood fretboard, contributes to the sound with complex highs, and thick and creamy lows for an overall well-rounded sound. The designer team really earned some credit by making the finish transparent black, so as to allow the top pattern to be visible. Some may have liked a natural, glossy finish, but the transparent black has its own charm.The rosette plays into this quite well, with an atypical design featuring some sort of barbed wire, chain lightning motif. The action feels just about right, neither too low nor too high, although keep in mind this may vary depending on factors such as temperature and humidity. Strings are ostensibly of good quality, they’re coated and feel medium to light. Playing is quite comfortable out of the box, though it needs tuning. However, once tuned, it holds the tune admirably well, surpassing other models in the same price range. 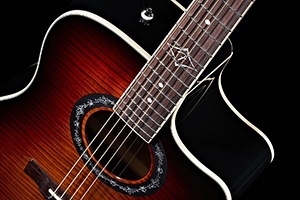 The guitar is beautiful, and, more importantly, it has a personality to match! The tone is medium, neither deep resonating nor twangy. The mahogany back and sides do a great job of tempering the brightness of the maple top, resulting in a much warmer and thicker sound.As noted previously, the strings will require tuning before use. If you’re a beginner, it’s probably best to have someone do it for you. Once tuned, they hold the tune well.You have the option to plug this bad boy in thanks to the Fishman Isys III System with Active On-board Preamp and Tuner. However, this by no means says that the sound is in any way inadequate when playing it unplugged.